Courtesy Ron Barber and John McCain in McCain’s small office just off the U.S. Senate floor on the day after a House vote for the National Defense Authorization Act that included Barber’s amendment to keep the A-10 flying and require a GSA study to examine the utility of the plane in current warfare. When I heard that Senator McCain died, I was celebrating my birthday with my family. I felt compelled to immediately sign on to Facebook and write a tribute to this inspiring American. "America lost a great patriot today. He served his country with distinction, courage and independence. I didn't always agree with the Senator's policies and votes but I never stopped admiring his integrity and understanding of how our Democracy and Constitution should work. Who will step up and be our scold about practices, behaviors and tweets that are antithetical to a functioning democracy? I had the good fortune to be his seatmate when we flew to D.C. from the memorial for the 19 firefighters who died in the horrific forest fire. We talked about our love for Arizona, saving the A-10s and about his relationship with Mo Udall. When Mo went into hospital due to his Parkinson's disease, John McCain visited him frequently, read to Mo and let him know that he was not forgotten. I long for those bipartisan times and for a person in the White House as caring, informed and thoughtful on complex issues as John McCain. Farewell, Sen. McCain. You have served us well. Much love to his family who feel this loss so deeply." With more time to reflect on his life, I welcomed this opportunity to share additional thoughts about this remarkable man. It hit me hard when the Senator's death was announced. I was deeply affected not only by the loss of a dedicated public servant but also by not having his voice with us any more in this time of great division in our country. He was the polar opposite of the man in the White House and his clear-eyed understanding of what this nation is all about is sorely needed. In 1959 at age 15, I immigrated to America. I fell in love with this country and its system of government. John F. Kennedy was running for President and I was inspired by his presence on the national stage. He spoke with soaring rhetoric and called on us to ask what we can do for our country. Sen. McCain was also such a leader. There is no denying his sacrifices both personal and political. He went to fight in a war that I opposed and acquitted himself heroically as a prisoner of war. He spent five and half years under dreadful conditions, enduring repeated tortures. When he was offered an early release, he refused because he would not leave his fellow POWs behind. He came back in poor health, unable to raise his arms due to his injuries in his plane crash and being hung by his arms in prison. He lived with his physical and psychological wounds for the rest of his life. And what a life it was! He served his country in the House of Representatives and the Senate. He ran for President twice and lost but in losing he showed genuine grace. His speech when President Obama won is a stirring example of how to lose with class. In the Senate, he sometimes voted against his party. One of his "maverick" actions was his leadership in restoring relations with Vietnam and denouncing torture. He joined a bipartisan group of Senators to sponsor a comprehensive immigration reform bill, which passed the Senate. He voted to break the filibuster on legislation that would require background checks on all gun sales. Following his cancer diagnosis, he returned to the Senate to say no to legislation that would have repealed the Affordable Care Act. I will never forget the meeting I had with him in 2014 following the passage of my A-10 amendment to the National Defense Authorization Act. My chief of staff and military legislative assistant attended with me. Known for his teasing humor, he went after my staff with a smile on his face. "Congratulations Ron, you got this passed even with this dumb staff of yours." These are the words of a true patriot. 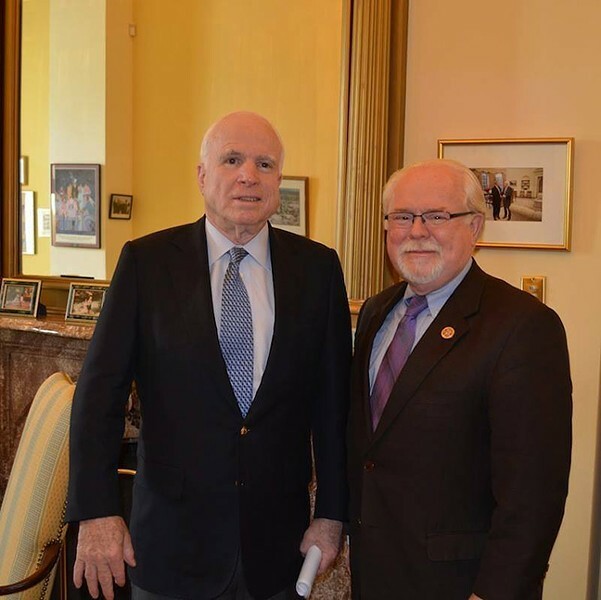 Ron Barber served Southern Arizona in the Arizona House of Representatives from 2012 until 2014.